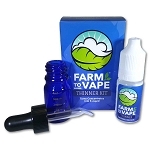 THC vape juice cartridges are small, disposable tanks that house a heating coil and hold a THC vape juice mix. Pre-filled or fill your own THC vape juice cartridges (carts) have become very popular in legal marijuana states with large year over year sales increases. Thc vape juice carts are really easy and inexpensive to make yourself even though they sell for a lot of money depending on what is going into them and how they taste. The ones that seem to be of higher value are ones that don't leak and have minimal "dry puff." This means the vape juice mix inside is tuned just right to that cartridge. Most cartridges are made using a herbal concentrate such as wax or shatter mixed with a thinning agent like Farm to Vape Thinner. The two are mixed and sometimes filtered through an unbleached coffee filter after being mixed at room temperature to remove the cellulose wax and lipids that prevent the THC vape juice mix from flowing to the coil chamber in the THC vape cartridge. Winterizing the concentrate is another great way to accomplish this before blending the concentrate with Farm to Vape on a larger scale. Once the THC vape cartridge has been filled with the THC vape juice, it gets installed on a 510 thread battery. Some of these batteries are "automatic" which means there is no button, you inhale, and a sensor turns on the battery, which applies power to the coil. Others have a button that has to be depressed. Once the mix inside the tank is made at a proper ratio and/or filtered from a stronger ratio, there is an entrance size to the coil chamber to account for. If the THC vape juice is too thick, it cant flow the hole fast enough, dry puff occurs. A larger hole or a thinner mix is needed. Once the viscosity of the THC vape juice is matched to the coil hole entry size it should work every time, never giving a "Dry puff". Dy puffs are very undesirable as they create a harmful foul burning taste by burning the coil dry. This permanently damages the wick in the coil and every inhalation afterwards will taste bad. The thinner the viscosity, the better the mix will flow into the coil. The THC vape juice mix should flow into the coil so every pull is tastes as enjoyable as the last and the flavor of the concentrate still reigns through.